I’m having a hard time realizing that it is actually July. Summer needs to slow itself down! If you have had enough of the heat (or the cold, if you are in the Southern Hemisphere) then a museum trip may be what you need. There hasn’t been much in the line of fashion history news in the past two weeks, so this special edition of Vintage Miscellany will focus on current exhibitions. Hopefully there will be one in your area. And feel free to add any I missed in the comments. 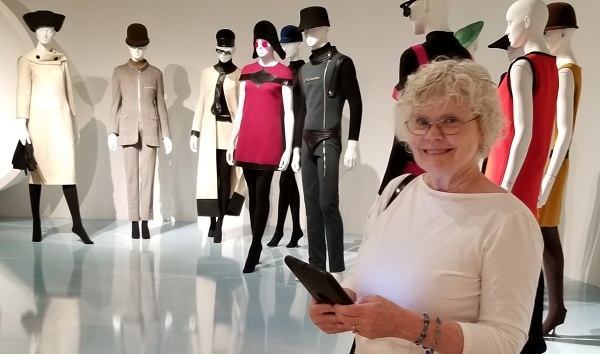 On view at SCADFASH in Atlanta is Pierre Cardin: Pursuit of the Future. That’s me above with some great Cardin pieces. Photo by Liza of Better Dresses Vintage. And if you are a fan of The Handmaid’s Tale, costumes from that program are also on exhibit. Hurry to the Brooklyn Museum if you are a David Bowie fan. David Bowie Is closes July 15. At the Met in New York is Heavenly Bodies: Fashion and the Catholic Imagination. It looks beautiful. Also at the Met, and sounding more interesting to me at least, is Visitors to Versailles. The Fashion History Museum in Cambridge, Ontario, is exhibiting 101 Tales of Fashion. Katharine Hepburn: Dressed for Stage and Screen is back home at the Kent State University Museum in Kent, Ohio. Also at Kent State are Fringe Elements and Fashion Timeline. The Museum at FIT in New York is currently showing Fashion Unraveled. Musee Yves Saint Laurent Paris, has two exhibitions about the designer currently on view. Margiela, The Hermes Years is at the Musee des Arts Decoratifs in Paris. The Victoria & Albert in London has Frida Kahlo: Making Herself Up. Also at the V&A is Fashioned from Nature. Kensington Palace in London continues to show many of Princess Diana’s clothes. At the Fashion Museum in Bath, UK, you can see A History of Fashion in 100 Objects, and Royal Women. Opening on July 28 in Edinburgh’s Dovecote Tapestry Studio will be Liberty Art Fashion and Fabrics. The Mint Museum in Charlotte is hosting The Glamour and Romance of Oscar de la Renta. There is also some good news for fashion lovers in the US Southeast. The Mint is adding galleries to be specifically dedicated to fashion and textiles. That’s all I have, but be sure to check out your own local museums. Even if there is not a “fashion” exhibition, you might be lucky to encounter clothing, textiles, jewelry, and other fashionable objects anyway. Mad for Plaid at Cleveland, Ohio’s Western Reserve Historical Society. Here Comes the Bride at Bulloch Hall in Roswell, Georgia. I really need to get along to the Royal Women exhibition – working in Bath, I do sort of resent going back into town at weekends! Not sure if this is the correct place to put this, but… if possible, could you please change to Katharine Hepburn, with an A. I love your blog, and take many vicarious trips with you.